"I brought my broken mug into my bike shop, scrambled around in a parts bin, pulled out a used brake lever and attached it. Voilà! The Coffee Brake Mug was born"
How was the Coffee Brake Mug born? It's a Coffee Mug with a bicycle brake lever as a handle. I didn't set out to design a new mug - it kind of happened by accident. It was a frigid Minneapolis morning and I was commuting to work on my bike like any other day, when all of a sudden, my front wheel slid on a sheet of ice and I crashed. My trusty mug (and hot coffee) hit the ground and the plastic handle shattered into a million pieces. I did what any other person would do—I brought my broken mug into my bike shop, scrambled around in a parts bin, pulled out a used brake lever and attached it. Voilà! The Coffee Brake Mug was born! What is the mission of the Coffee Brake Mug? To create the strongest, toughest coffee mug on the planet! What are some of the key features of the design of your product? I think the key feature is the bicycle brake handle. It's a sturdy handle to hold on to, and it's unique, setting it apart from all other Coffee Mugs on the market. What makes a good mug? For us, a good mug is a strong mug you can use everyday, that can put up with all kinds of abuse. Our desire is that the Coffee Brake Mug is last mug you ever have to buy. What are some of the greatest challenges in the drinkware industry today? There are so many choices, with varying quality and price points. It may be easy to hurry and get a product on the market, but it takes a lot of time, testing, and communication to get a quality product. Given that the drinkware industry is very competitive, how do you stand out? The Coffee Brake Mug is the only mug with a brake lever as a handle. 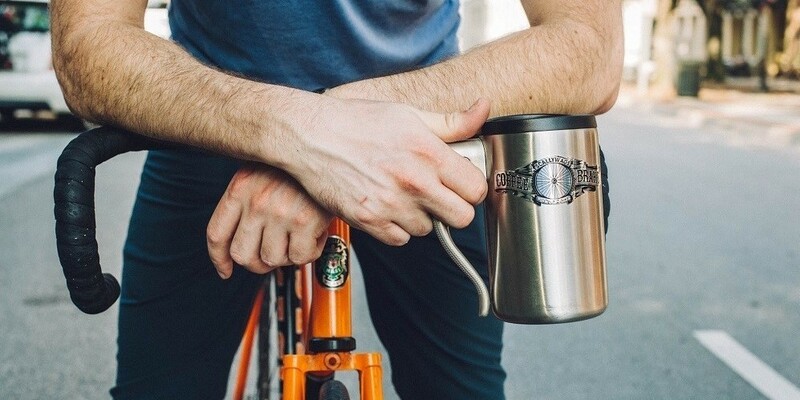 We're combining the great accomplishments of the cycling component industry with a tough stainless steel mug. What's the greatest achievement of Coffee Brake Mug? We feel honored that our product has made its way all around the world. Our greatest achievement is developing a product that crosses many cultures and people groups, and we have such a diverse customer base. We love our customers!! What is the plan of Coffee Brake Mug in 2017? Our plan is to fulfill all the crowdfunding pledges and pre-orders, and then get ready for the fall/winter Christmas rush that will be here sooner than we think. Know your product inside and out. Get into the shop and sweat it out. Refine and improve your product. Know who your customers are, and listen to their constructive criticism. Mugs. With bike brake handles. For everyone.